All molds have the potential to cause health effects. Molds produce allergens, irritants, and in some cases, toxins that may cause reactions in humans. 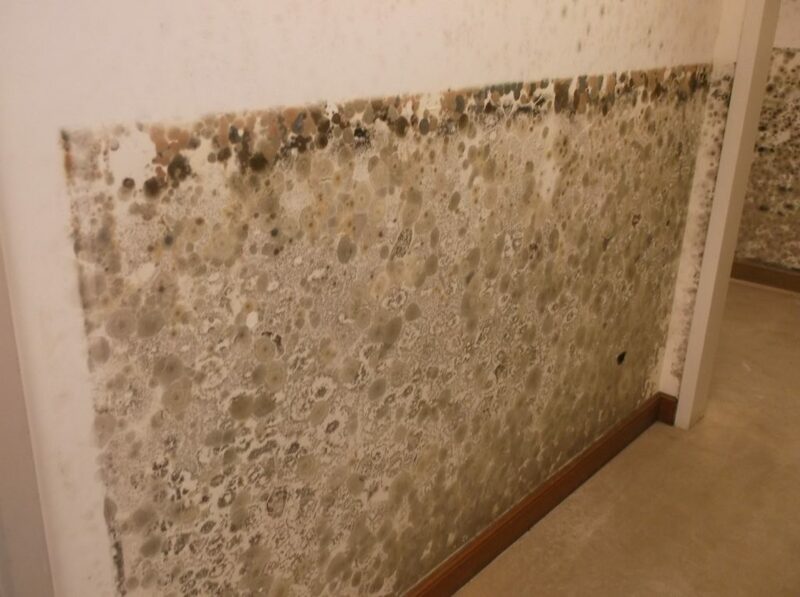 The types and severity of symptoms depend, in part, on the types of mold present, the extent of an individual’s exposure, the ages of the individuals, and their existing sensitivities or allergies. Aspergillus and Penicillium spores are indistinguishable via direct microscopic examination. Aspergillus tends to colonize continuously damp materials such as damp wallboard and fabrics. Penicillium is commonly found in house dust, on water-damaged wallpaper, behind paint and in decaying fabrics. Aspergillus is a common type I & III allergen. They are frequently isolated from forest products, soils, grains, nuts, cotton, organic debris, and water damaged building materials. Spores can also be found in moist ventilation systems and house dust. There are more than 160 different species of Aspergillus, sixteen of which have been documented as etiological agents of human disease but rarely occur in individuals with normally functioning immune systems. However, due to the substantial increase in populations of individuals with HIV, chemotherapy patients and those on corticosteroid treatment, contamination of building substrates with fungi, particularly Aspergillus is of concern. Aspergillosis is now the second most common fungal infection requiring hospitalization in the United States. Many Aspergillus species produce mycotoxins that may be associated with diseases in humans and other animals. Toxin production is dependent on the species or strain within the species and on the food source for the fungus. Some of these toxins, such as aflatoxins and ochratoxin are carcinogenic . Aspergillus is a common cause of extrinsic asthma with symptoms including edema and bronchiospasms, and chronic cases may develop pulmonary emphysema. These fungi are frequently secondary opportunistic pathogens in patients with bronchiectasis, carcinoma, other mycoses, sarcoid, and tuberculosis. Some species can also cause onychomycosis (infection of the nail). A large number of organisms belong to this genus, and identification to species is difficult. Often found in aerosol samples, it is common in soil, food, cellulose, paint, grains, and compost piles. In the indoor environment it is in carpet, wallpaper, and in interior fiberglass duct insulation. Although this fungus causes fewer allergies than other molds, Penicillium is reported to be a type I & III allergen. It may cause hypersensitivity pneumonitis and allergic alveolitis in susceptible individuals. It can cause other infections such as keratitis, penicilliosis, and otomycosis. Some species can produce mycotoxins including Ochratoxin, which is damaging to the kidneys and liver and is also a suspected carcinogen; there is also evidence that impairs the immune system. It also produces Citrinin that can cause renal damage, vasodilatation, and bronchial constriction and Gliotoxin, which is immunosuppressive. Patulin is another of its mycotoxins that is believed to cause hemorrhaging in the brain and lungs and is usually associated with apple and grape spoilage. It can also cause extrinsic asthma. P. camemberti has been responsible for inducing occupational allergies among those who work with soft white cheeses on which the fungus grows (cheese washer’s lung). P. marneffei is the major pathogenic species causing infections of the lymphatic system, lungs, liver, skin, spleen, and bone, and is also the only species of the genus to have a yeast-like phase induced by temperature. Cladosporium is widely distributed in air and rotten organic material. C. herbarum is the most frequently found species in outdoor air in temperate climates. It is often found indoors, usually in lesser numbers than outdoors. The dry conidia become easily airborne and are transported over long distances. This fungus is often encountered in dirty refrigerators, especially in reservoirs where condensation is collected. It can easily be seen on moist window frames covering the whole painted area with a velvety olive-green layer. Cladosporium often discolors interior paint, paper, or textiles stored under humid conditions. Houses with poor ventilation, houses with thatched straw roofs and houses situated in damp environments may have heavy concentrations of Cladosporium, which will be easily expressed when domestic mold is analyzed. It is commonly found on the surface of fiberglass duct liners in the interior of supply ducts. It is also found naturally on dead & woody plants, food, straw, soils, paint, and textiles. The ability to sporulate heavily, ease of dispersal, and buoyant spores makes this fungus the most important fungal airway allergen; and together with Alternaria, it commonly causes asthma and hay fever in the Western hemisphere. Skin abscesses, mycotic keratitis and pulmonary fungus ball have been recorded in immunocompromised patients. It may also cause corneal infections and mycetoma, characterized by localized infections that involve cutaneous and subcutaneous tissue, fascia, and bone consisting of abscesses, granulomata, and draining sinuses, usually in immunocompromised hosts. Cladosporium produces the toxins cladosporin and emodin, but neither of these is very toxic. Alternaria is a large and widespread genus, the conidia of which are easily carried by the wind, with peak concentrations in the summer and early fall. Alternaria is commonly found in house dust, carpets, textiles, on horizontal surfaces in building interiors, and window frames. It is one of the main fungal causes of allergy, being a common type I & III allergen. Outdoors, it may be isolated from samples of soil, seeds and plants, and is frequently reported in air. The large spore size suggests that this fungus will deposit in the nose, mouth and upper respiratory tract causing nasal septum infections. It has also been associated with hypersensitivity pneumonitis. It is a common cause of extrinsic asthma. Acute symptoms include edema and bronchiospasms; chronic cases may develop pulmonary emphysema. Baker’s asthma is associated with inhalation of Alternaria conidia present in flour. Other diseases caused by Alternaria include: Farmer’s lung, mycotic keratitis, skin infections, and osteomyelitis. Also, the species A. alternata is capable of producing tenuazonic acid and other toxic metabolites that may be associated with disease in humans or animals. Several species are pathogenic to plants and contribute to the spoilage of agricultural products. Stachybotrys is commonly found in sub-tropical to tropical areas in soil and decaying plant materials, and is considered a type I & III allergen. Considerable recent media attention has been focused on the fungi Stachybotrys chartarum (atra) due to infant deaths in Cleveland from pulmonary hemosiderosis, which may be associated with contamination of residences with this fungus. Stachybotrys thrives on water damaged cellulose rich materials such as sheet rock, paper, ceiling tiles, cellulose containing insulation backing and wallpaper. The presence of this fungus in buildings is significant because of the mold’s ability to produce mycotoxins, such as Satratoxin H, Trichoverrol, and Cyclosporins that possess cytotoxic, immunological, carcinogenic effects. Exposure to these toxins can occur through inhalation, ingestion or dermal exposure. Symptoms include dermatitis, cough, rhinitis, nose bleeds, a burning sensation in the mouth and nasal passage, cold and flu symptoms, headache, general malaise, and fever. Inhalation of conidia may also induce pathological changes (pneumomycotoxicoses). Satratoxin H has been reported to be abortogenic in animals and in high doses or chronic low doses it can be lethal. S. chartarum (atra) produces other macrocyclic and trichoverroid trichothecenes and, like Memnoniella echinata, produces phenylspirodrimanes, which are immunosuppressive. Stachybotrys typically appears as a sooty black fungus occasionally accompanied by a thick mass of white mycelia. Memnoniella differs from Stachybotrys by producing conidia in chains. As a general rule, air sampling for Stachybotrys yields unpredictable results mainly due to the fact that this fungus is usually accompanied by other fungi such as Aspergillus and Penicillium that normally are better aerosolized than Stachybotrys. Aladdin Environmental, LLC are the experienced mold mitigation specialists serving both residential homes and commercial businesses across San Antonio.